Hello! It's Kara and I couldn't be happier to be here sharing this tropical project with you! 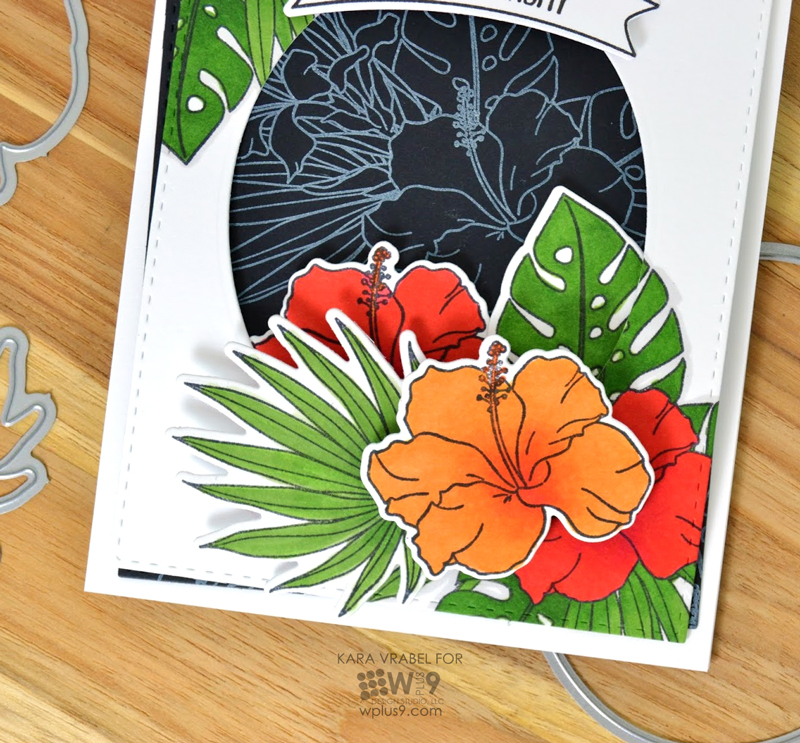 I have been loving tropical motifs lately so when this new release arrived at my house I was thrilled to see all of the new tropical stamps and dies. I grabbed the Hibiscus Bouquet set right away and made this card. I started by stamping the bouquet in two opposing corners and colored them with Copic markers. I chose reds and oranges that reminded me of the hibiscus outside our house where I grew up in Florida. I decided to create an oval window using the Basic Labels Die. 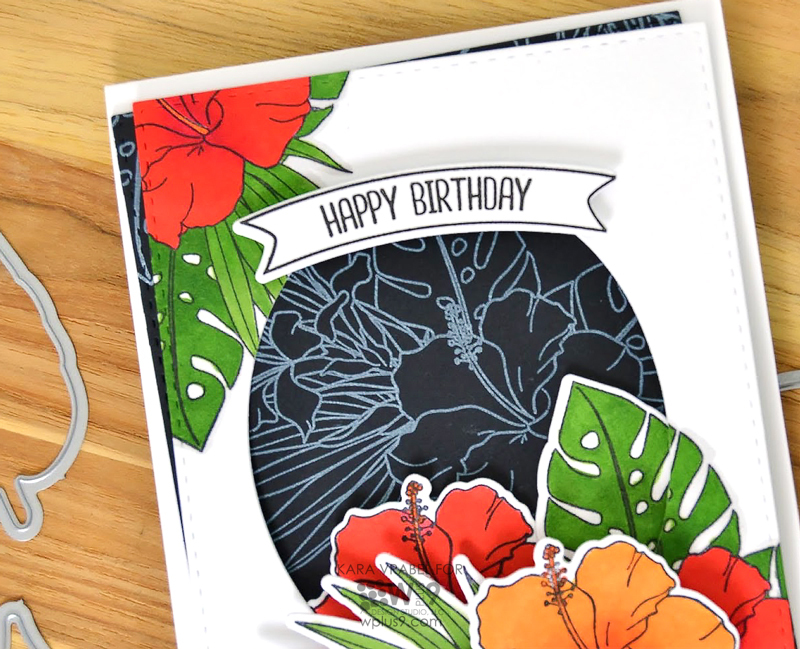 To add some dimension I stamped, die cut, and colored a few images from the new Tropic Fever set which works so perfectly with the Tropical Bouquet. Using the new Oh My Gostrich! stamp set and coordinating dies I created this little Happy Birthday banner at the top of the window. To add some interest inside the window, but not take the focus off those beautiful flowers, I added some chalkboard style stamping on a black panel placed behind. I hope you're enjoying this release! Thanks so much for stopping by. Hello! In my last post, I introduced you all to the new Tropic Fever stamp set. 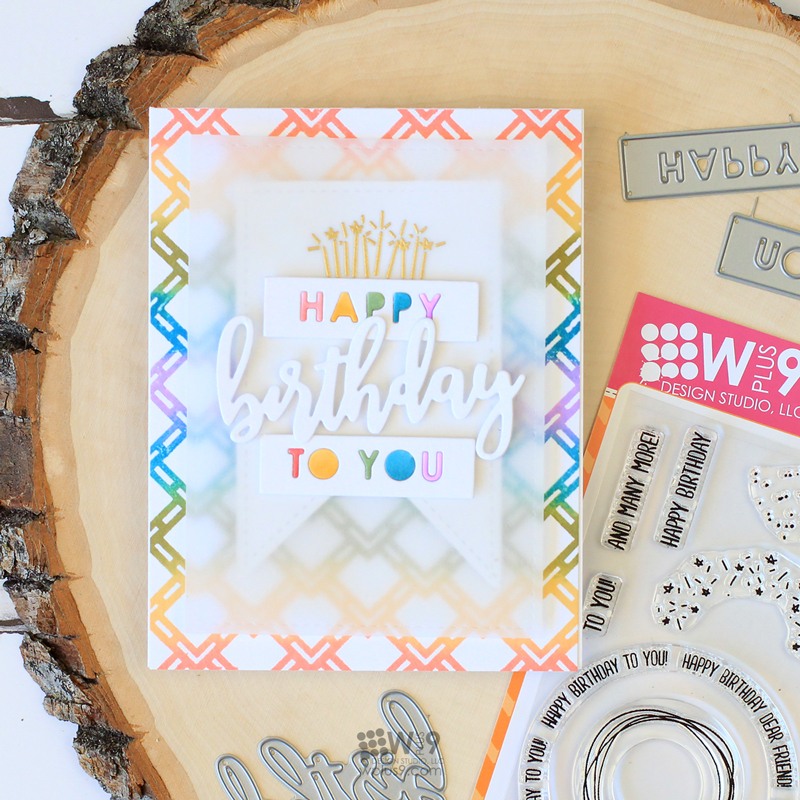 Today, I wanted to share a totally different look for it by pairing it with our Happy Birthday Die. I really love how a good background image can add such interest so easily. 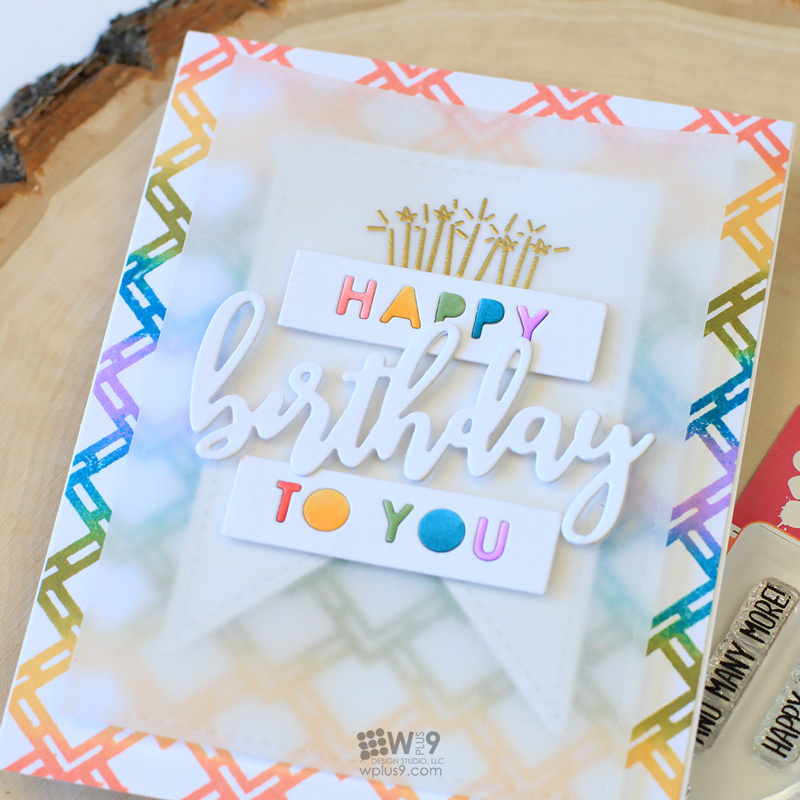 For the card featured here, I used a Kaleidoscope Uninked pad to create my own rainbow ink pad by filling it using our PURE COLOR reinkers. I chose Flamingo, Wild Mango, Appletini, Falling For Blue and Bloomsberry. I inked up the background stamp included in Tropic Fever and stamped to quickly create the all-over rainbow pattern. For the sentiments, I die cut the "Happy" and "To You" labels twice from white cardstock. On one set, I quickly colored the letters with Copic Markers to match my inks and then replaced the letters in the second one. There is a little trick for this that makes it super fast and easy and you don't have to fiddle with the letters. I show you how in the video above. I adhered a couple of the "birthday" die cuts on top of each other to give it a little weight and adhered them all with foam tape. I wanted the sentiment to stand out from the background, so I cut a fishtail banner and vellum square to layer behind them. For the candles above the "happy" label, I stamped the image from the And Many More! stamp set and heat embossed in gold. I think this is a great gender neutral birthday card that is great for all ages. How about you? 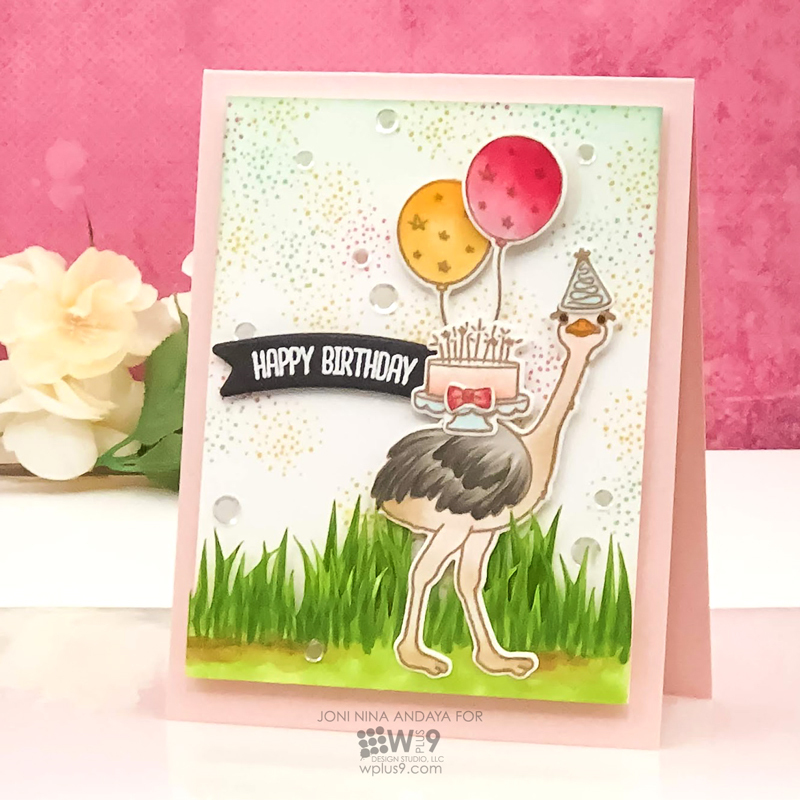 If you want to see this background in action on a few different variations of this card, be sure to watch the video as I share quite a few different versions. Loving these monochromatic tropical cards. 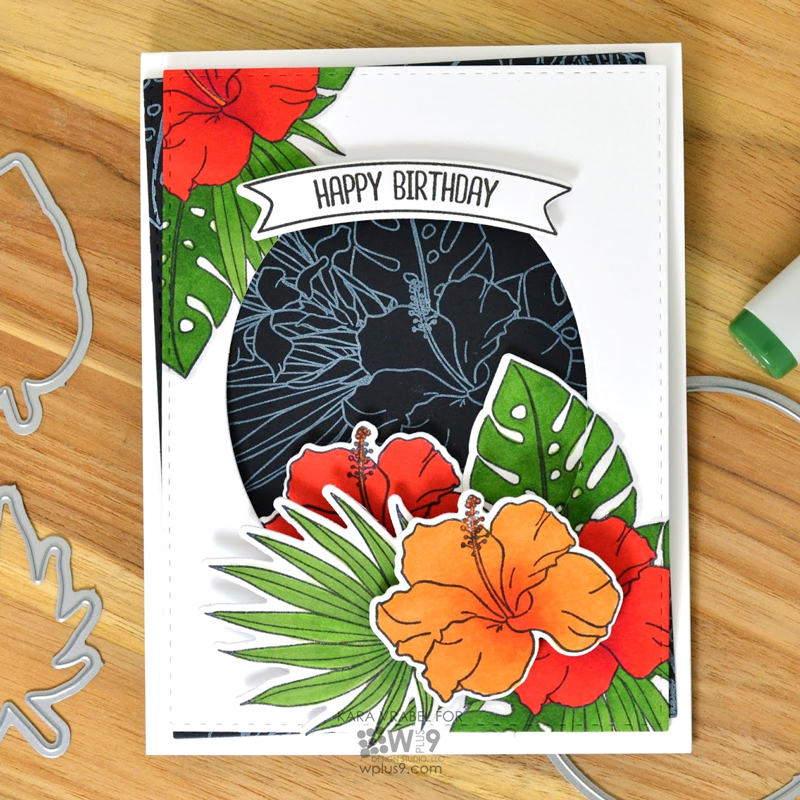 A gorgeous hibiscus birthday card. 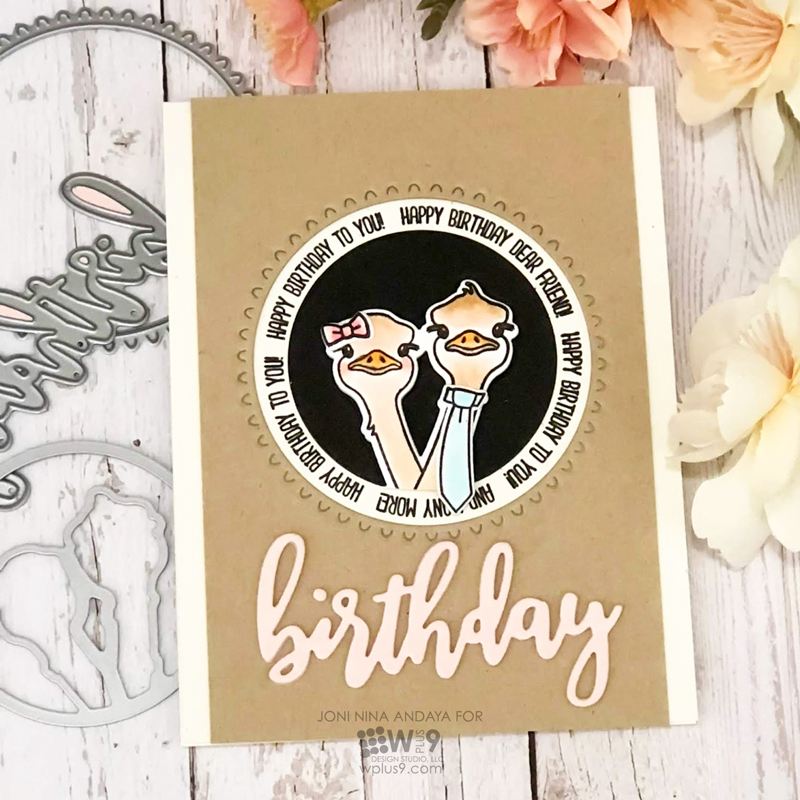 A fun birthday card featuring And Many More and the Happy Birthday Die. I hope you enjoyed today's projects and as always, thanks for stopping by! Hello Everyone! Joni here sharing my take on the new Oh My Gostrich! stamp set and companion die. For the background, I used my Silhouette to cut some grass from white card stock and colored it using Copic Markers. 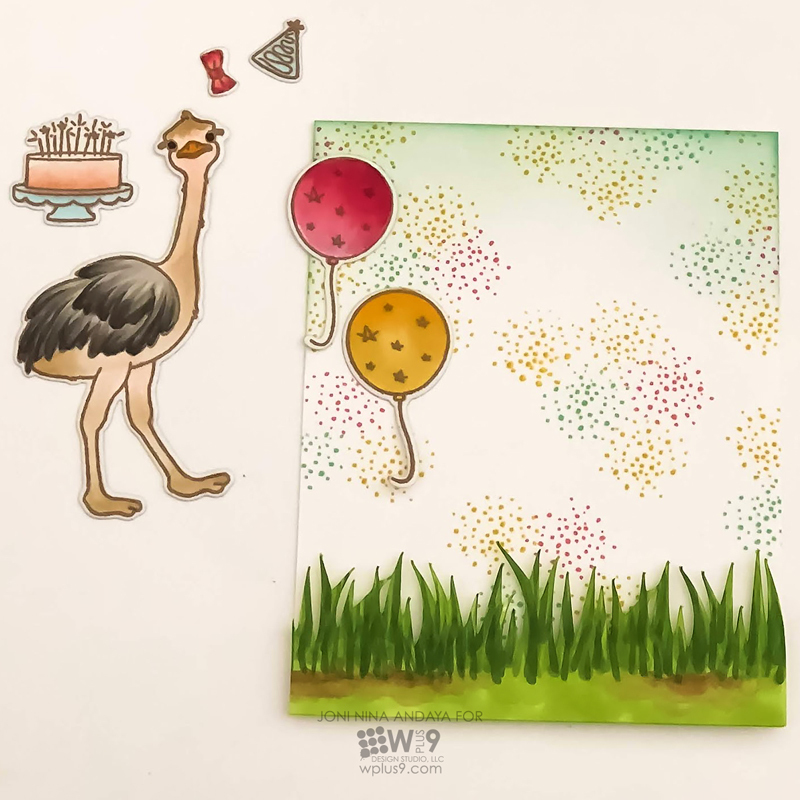 I stamped all of my images, colored them with Copics and then used the Oh My Gostrich! Die to cut them all out. 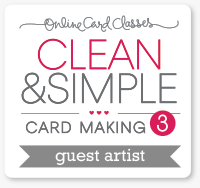 For the background of the white card panel, I used the small confetti burst image from the And Many More! stamp set stamped in several different colors. I heat embossed "Happy Hirthday", also from And Many More!, in white onto black cardstock and die cut using the banner from Oh My Gostrich!. Then I added some Sparkling Clear Confetti from Pretty Pink Posh. 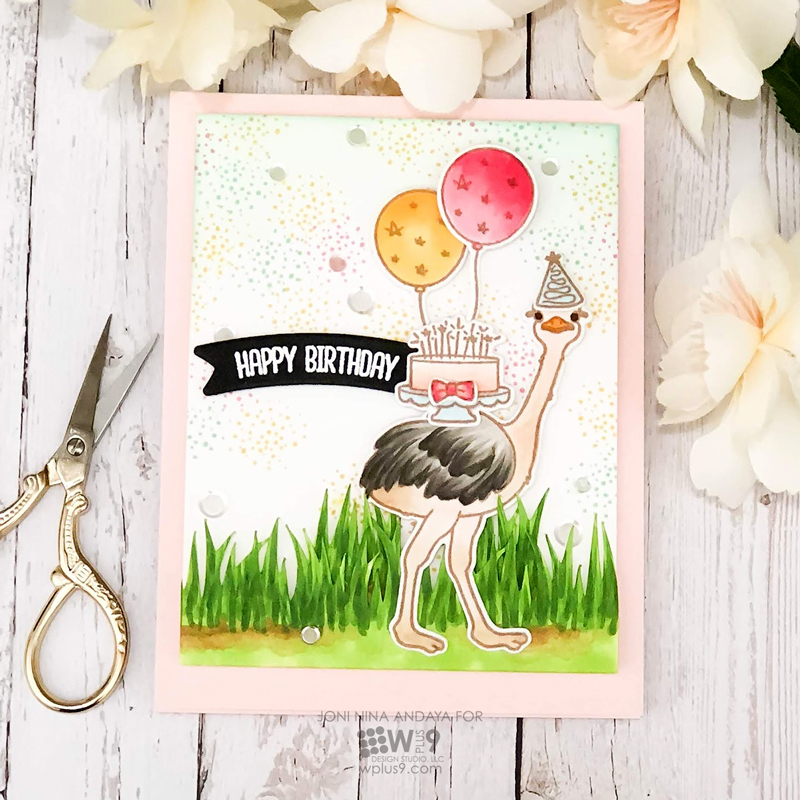 For my second card, I used the cute double ostrich image. It could be a pair or a couple, like I've chosen to depict today. Next, I die-cut the Kraft panel using the decorative border circle from Oo My Gostrich! Die, then stamped the circular sentiment from And Many More!. I die-cut the space from the two ostrich in black then adhered the ostrich on the card with foam tape. 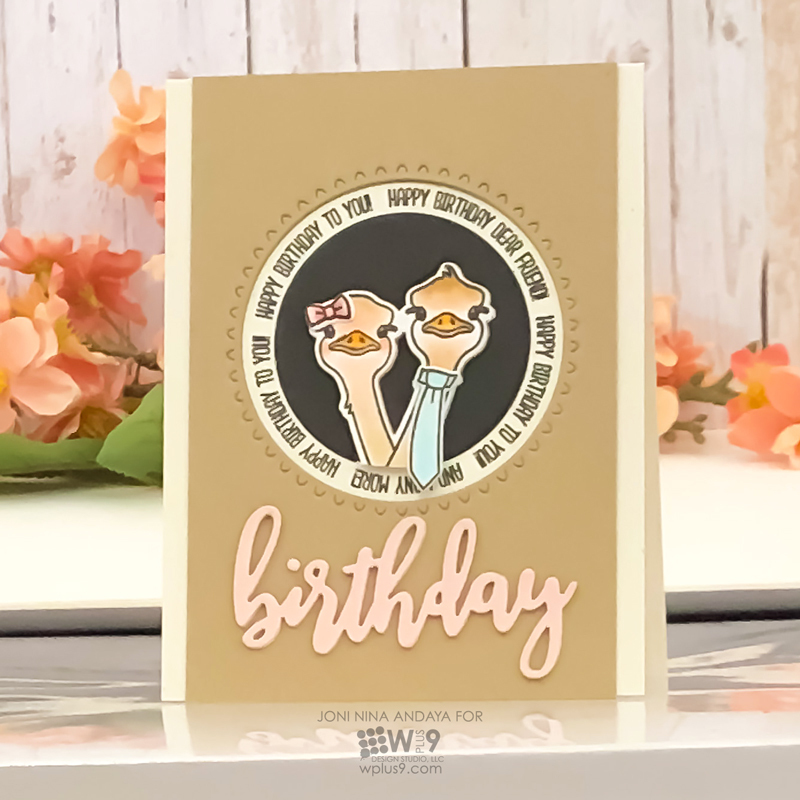 I also added a birthday cut out using the "birthday" from the new Happy Birthday Die to finish off the card. Labels: And Many More!, Birthday, Happy Birthday Die, Joni Andaya, Oh My Gostrich!